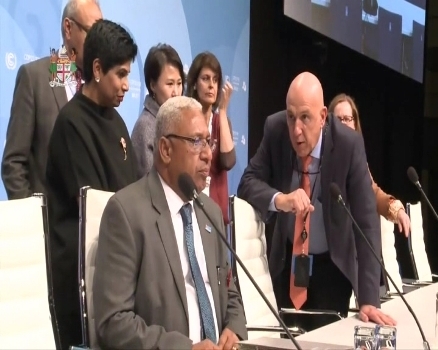 Prime Minister Voreqe Bainimarama has been briefed by senior officials of the United Nations Framework Convention for Climate Change on the various protocols that will need to be observed when he assumes the presidency of COP23. At a dress rehearsal at the venue of this year’s event in Bonn, Germany – the PM was given a rundown of the events that will take place on November 6th when he takes over the COP presidency from Morocco. With over twenty-thousand participants expected at this year’s COP, the role of presiding over COP23 for Fiji is crucial amidst a backdrop of increasing climate change debate and severe changes in weather patterns. This year’s COP will also be significant given that this is the first time that a Small Island Developing state will be presiding over negotiations. Meanwhile Bainimarama has welcomed the G77 and China’s support for Fiji’s presidency of COP23. At bilateral talks, between Bainimarama and the Chair of the G77 and China, discussions looked at ways that both parties can work closely with each other to produce a successful COP. Yesterday the current Chair, Ecuador, expressed on behalf of the members their full support towards Fiji’s presidency of COP23. Bainimarama will officially assume the presidency in a ceremony at the World Conference Centre in Bonn, Germany.